Consonance / Bach in the Dark. Bach construct no. 1 : Suite no.1 for cello (Prelude), for guitar and cello / JS Bach, with an original countermelody by Richard Charlton. Bach construct no. 1 : Suite pour violoncello no. 1 (Prelude), for viola and guitar / JS Bach, with an original countermelody by Richard Charlton. A new countermelody for cello created to go with the guitar version of the Prelude from the Cello Suite no. 1 by J S Bach. 11 Oct 2013: at Bach in the Dark (St James Church Crypt). 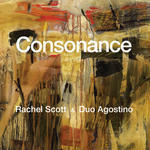 Featuring Rachel Scott, Raffaele Agostino.